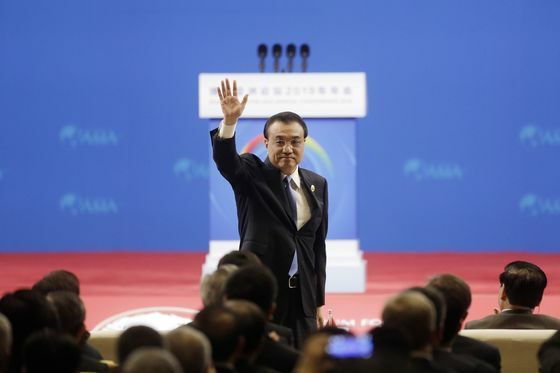 (Bloomberg) -- Premier Li Keqiang said China’s domestic economy showed signs of stability amid targeted stimulus support, although new threats were arising from weakness in global demand. The government this month unveiled a record 2 trillion yuan ($297 billion) tax cut and has worked since last year to improve the supply of credit to small businesses and the private sector. While signs of stabilization in the local economy continue to appear, the U.S.-China trade war remains a major source of uncertainty. Negotiations continue in Beijing from Thursday. Li was upbeat on the domestic outlook, although he sounded a warning on the global economy. Concerns of a downturn are multiplying amid signs that trade is being hammered due to recession fears in Europe and China’s own slowdown. Li said that his government was now working to implement a new foreign-investment law passed this month, which seeks to address some of the concerns about access to the Chinese market that have fueled U.S. complaints. China planned to abolish all laws that contradict the new investment code, draft regulations on its implementation by year-end, he said, and work toward treating all companies, Chinese and otherwise, equally. In addition, the government would continue shrinking the list of sectors foreign companies can’t invest in, Li said. "We’ll only reduce items instead of increasing items" on the negative list, Li said. "We’ll further open up sectors including modern services such as value-added telecom, healthcare, education as well as transportation, infrastructure, energy and resources. Li also repeated promises that investors from Hong Kong, Taiwan and Macau wouldn’t be adversely affected by the new investment law, comments that drew enthusiastic applause from the audience in Boao. "We’ll protect and maintain the consistency of the policies regarding Hong Kong, Macau and Taiwan investment," he said, promising both clear rules and that there would be no change to the favorable polices those firms have enjoyed until now. "We’ll ensure better protection of the rights of Hong Kong, Macau and Taiwanese companies, and allow them to prosper even more."